Program #CULT071. Recorded in Mumbai, India on September 18, 1987. Yaman, an evening melody is one of the most popular of all ragas and a Debu Chaudhuri speciality. 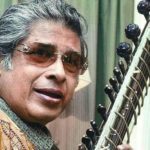 In this recording the sitar maestro renders a delicate and detailed musical tapestry. After the alap, where the contours of raga are explored, he plays slow and fast compositions. The second performance in this recording is the majestic night raga Bageshree. After an evocative alap he plays medium and fast tempo compositions. He is accompanied on the tabla by Nayan Ghosh, son and disciple of Pandit Nikhil Ghosh.